Something must be done about the art decorating the covers of C. J. Cherryh’s unheralded FOREIGNER series. No offence to Michael Whelan, Dorian Vallejo, or any other of the artists who’ve been chosen to provide cover art, but their Golden Age depictions of alien life simply do not suit the temper of the books. Shame on DAW. Cherryh writes with subtlety and sensitivity regarding intercultural relations that the comic book renderings of guns and fantasy animals simply fail to parallel. Making matters worse, the crowd willing to buy the books based on such art will more than likely end up disappointed. The books’ focus on character and societal development toward peace and cultural understanding is far from scene after scene of gun fights and explosions. Like placing a scantily clad Barbie doll with elf ears and flaming sword on a Gene Wolfe cover, expectations simply cannot be met. I gripe not only because book covers are a part of the reason the literati refuses to take sci-fi seriously (what adult reader of academic leaning wants to walk around with a tentacled alien attacking a bare-chested, laser-pistol wielding man on the cover), but also because Cherryh’s series is a primary example of sci-fi in which said academics could find material to study and promote. Numerous PhD dissertations could be written on the method and manner in which the inter-personal relationships of the humans and the atevi are described and handled by Cherryh. The emotions and behavior in the books are drawn from an entirely human palette, the fantastic coming from setting alone. But I digress. On to the book. 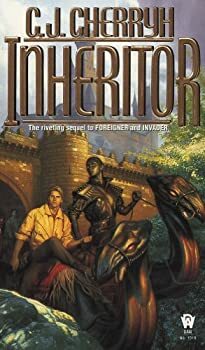 Inheritor, remaining true to the preceding two novels, Foreigner and Invader, again selects character interaction as its focal point. This time around, however, Cherryh adds new dynamics to the stage. Jase, the envoy from the orbiting ship who landed at the end of Invader, is now embedded in the atevi government alongside Bren and is trying to learn the language and adapt to the culture. Jase faces numerous challenges, social and personal, in making the transition from space life to planet life, human life to atevi life. Bren, having consciously and sub-consciously altered his behavior to fit amongst their seven-foot ebony hosts, expects Jase to do the same. But he does not always meet with a positive reaction. Jase is as much “Other” as the atevi, thus springing new relational challenges upon the characters and reader. Cherryh focuses much of Inheritor’s content on the juxtaposition between Bren and Jase: one who has changed significantly from a typical human vs. one who is normal by most measures. The majority of dialogue is spent arguing about the alterations to behavior and mindset that do or do not need to occur. Running parallel to their conflict, the enmity between the humans on Mospheira Island and the native atevi grows more vitriolic, heaping further troubles upon the two’s already uncomfortable relationship. Fundamentalists on the human side and rebel factions on the atevi side act as terrorists, trying to prevent the atevi in power from acquiring space capabilities. As such, Bren’s diplomatic capabilities — personal and political — have yet to face such a challenge in the series. Cherryh’s style is more clean and direct than the bloated nature of Tom Clancy’s political thrillers; the decisions, implications, and repercussions faced by the atevi and human governments, sub-groups, and people are all described in realistic fashion. As with the previous novels, the author takes her quality time unpacking the situations which arise, relaying subtle nuances and possibilities as pertinent. The slightest rumor and changes in status have profound impacts on the state of the atevi world. It is unfortunate then that the book’s ending proves such a clash to the rational fashion in which the setting is presented. Where only one or two total plot twists occurred in the previous books, an entire handful are exposed at the climax of Inheritor. Stretching the limits of plausibility, the wholly unrealistic manner in which Cherryh wraps up the plot threads undermines the quality of the novel to a certain degree. As stated, however, the series is not to be read for plot, and one must balance the feel-good note on which the book ends with overall intent. This series was recommended to me by a young friend (I call him young; he’s 30) for many of the reasons you listed in the review. I agree about those covers. Thanks for giving these books a higher profile. Despite the recommendation I haven’t started reading them, but they’ve moved up on my TBR list. These are books I’ve been meaning to red for years. I own most of them. I must get to them soon. I’m a French reader and I started reading in English thanks to that serie. Only books 1 and 2 are translated in French so I took the plunge and have been following the serie in English since. It can be challenging, even considering it’s not my native language. Details are really important, be it about culture, about history, people or politics. I love how CJ Cherryh handle the interaction between human and atevi, the learning to understand and to respect each other’s differences. Bren is one of my favourite character, ever. That is so cool, Catlinel!